Julie Salva taught me how to make this fun pop up gift card holder. It can be used for any occasion by switching out the Designer Series Paper. Add frills or leave it plain. Works for anyone, any age! Here is how it looks when you open it up. Gift cards (and the holders they come on, if you wish) fit right inside the slot. This one didn't even need a stamp! I love it! Thanks for stopping by today! I hope you are inspired. I hope to post more cards coming up soon! 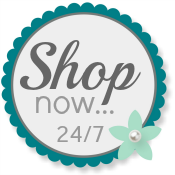 Please use my Online Store for your Stampin' Up! products. I'd love you to choose me as your demonstrator! All of your cards are fantastic! I LOVE the color combos and they look so different from one another. TFS your projects with us.